Thurgood, by George Stevens, Jr., is a celebratory overview of the extraordinary life of a civic-minded litigator. 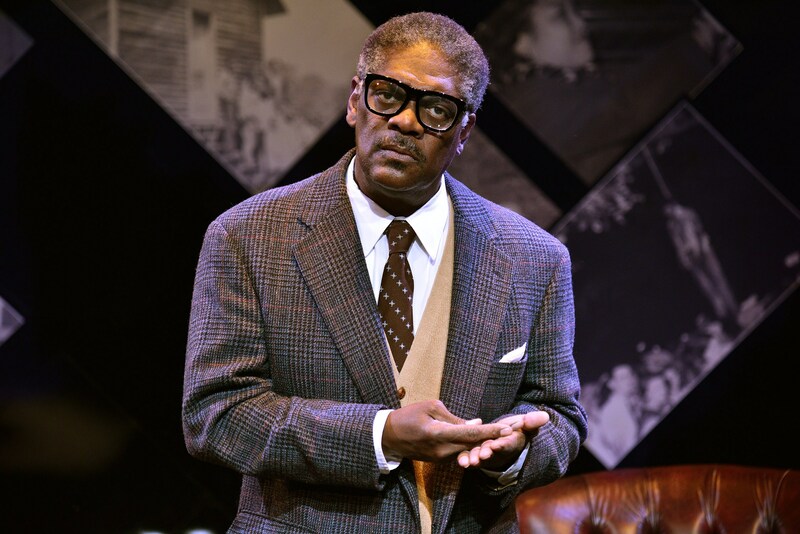 Directed by Benny Sato Ambush, this one-man-show stars Johnny Lee Davenport as Thurgood Marshall. The production is the first in New Rep’s Prophetic Portraits Series, which will examine history through the lens of individual lives. Staged as the United States’ first African American president is about to leave office, the production feels particularly poignant, wistful, and wary of the permanence of human rights victories. Thurgood Marshall’s most famous legal victory was in the landmark case Brown v. Board of Education, responsible for desegregating public schools. Marshall was also the first African American to be appointed as a Supreme Court justice. These are just two peaks in his life, and the play leads us up to each point by traversing through Marshall’s upbringing, education, marriages, activism, and rise to the highest court in the land. The Mosesian Center Black Box theatre is particularly conducive to recreating a cozy space for reminiscences. The program indicates the three-quarter-stage space is supposed to be “a lecture hall at Howard University,” where Marshall completed his law degree (scenic design by Ryan Bates). I assumed the space was an intimate office: we see a huge pile of law books in the corner, a large wooden table, a beautiful distressed tufted leather wheeled chair, and a side table with a pitcher of water, a fruit bowl, and a decanter of whiskey. The audience is invited to sit back quietly and listen to the older man as he recounts his life. Davenport’s demeanor is that of a boisterous and unpredictable grandfather, tittering with self-amusement one minute, thundering in anger the next. Davenport is exquisite at modulating his voice to embody Marshall’s various family members, friends, colleagues, and enemies. He expertly shuffled around the three-quarter stage, wheeling the lovely leather chair back and forth, alternating sips of water with sips of “whiskey,” seeming to address every audience member individually, the way a skilled lawyer reaches out to each and every member of a jury. The young Marshall was motivated by his parents and various mentors, life-saving buoys in a roiling ocean of unceasing discrimination from his white contemporaries. I was struck by the anecdote Marshall recalls of working as a headwaiter in a restaurant. Despite his father’s admonition that Thurgood should confront any white man who dared call him the N word, Marshall constantly accepts the racial epithet spewed by a rich man who routinely leaves $20 tips for him. I couldn’t help recalling the Huntington Theatre Company’s production of How I Learned What I Learned, an autobiographical show about the life of August Wilson. In that show, Wilson (played by Eugene Lee), proudly recounts the multiple times he quit jobs when facing overt racism from white people. I don’t think there is any right or wrong way to face racism; it is entirely a personal question. But Marshall’s honest admission of his compromise of principal in exchange for much needed earnings is compelling and very humanizing. The first half of the two-hour show moves at a comfortable pace. Sadly, after the climatic legal victory of Brown v. The Board of Education, the show’s pace drops considerably, and the vividness of Marshall’s anecdotes fade. I don’t blame Davenport as much as the text of the play. As Marshall dons his justice robes, we leave the realm of biopic and enter a Wikipedia page of listed achievements. To quote Douglas MacArthur (mentioned in the play), the story of the great man does not die so much as it fades away, losing steam. The shift in narrative also signals a slide into hagiography, aided by occasional cueing music that uplifts but borders dangerously on schmaltz (composition and sound design by Dewey Dellay). Thurgood is blunt in his assessment of his youthful follies; older Thurgood makes a few oblique references to his excess drinking and alleged womanizing, references we seem to be expected to shrug off with a nervous chuckle, as they are not further explored. Don’t let these quibbles discourage you from attending this production, staged at just the right time in our current political climate. As the program notes explain, Thurgood Marshall himself confessed to feelings of hopelessness for America’s future, as his tenure on the Supreme Court came to an end. Marshall would have been pained to see how America’s schools suffer from more insidious forms of segregation than those he battled in his day. And just a few weeks after this production opens, we will witness Barack Obama step down and leave the presidency, and thus his own legacy, in the hands of those determined to rip it to shreds immediately. Thurgood doesn’t exactly offer consolation for the uncertain times ahead. But it does offer the hope and the reminder that there will always be those who stand for justice, even in the face of a shotgun and a noose. New Rep Theatre’s production of Thurgood is playing now through February 5th, 2017, at the Mosesian Center for the Arts in Watertown.